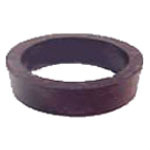 Large 2-inch inner-diameter black rubber ring for standard 3-inch long flippers. Measures 1-1/2 inches ID x 1/2-inch tall x 3/16-inch thick. Fits most makes/models. Replaces Capcom # RB00114-BK, Bally/Williams # 23-6695 & # 23-6678-7, Data East, Sega, Stern # 545-5277-00.